How do I resolve missing characters in my unicode font? I have tried Firefox and Chrome and on Ubuntu 14.04 LTS, and there seems to be a sizeable chunk of Unicode characters that I cannot render. Here is one example, and here is another example. What is the best course of action to diagnose the root cause and fix the missing characters? In order to see the missing characters, you need to install a font which contains them. I've found that Symbola contains the best range of characters. Install the two .ttf fonts - if you double click on then, you should see a font preview, click the "Install" button. With the latest version (8.0.0) I'm able to see the dog symbol 🐕 and the slice of pizza symbol 🍕. Then, restart your browser and everything should work as expected. I tried to view the characters on my computer (See signs and symbols). Enter the Unicode-code in the search-window. 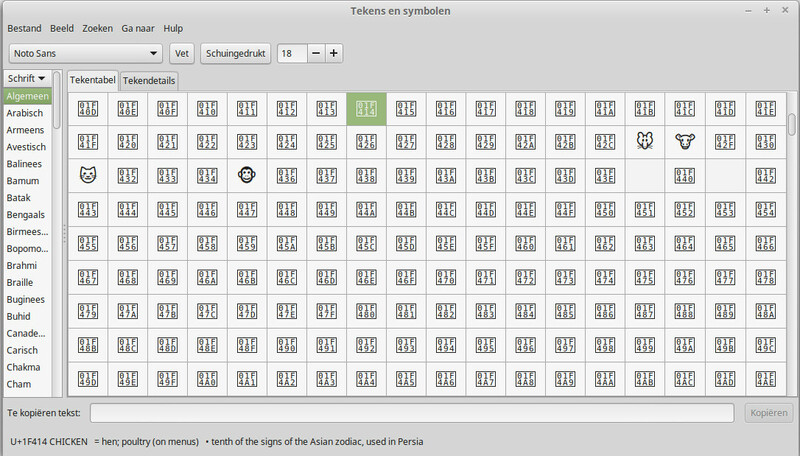 It looks that the symbols mentioned are not rendered yet (These characters are in the Supplementary Multilingual Plane). See also http://www.ltg.ed.ac.uk/~richard/unicode-sample-3-2.html. Not the answer you're looking for? Browse other questions tagged fonts unicode . Bangla font problem in blogger.com? Which font is needed to display a specific Unicode character?